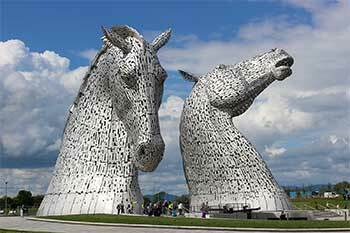 Below is a selection of quality visitor attractions in Scotland both for rainy and sunny days out. By clicking on the image or title of the attraction you are taken to the respective website or webpage. Please always check opening hours with the individual attractions to avoid disappointment. Scotland is a diverse and stunning destination for any visitor or resident wishing to explore their homelands full potential and pleasures. To maximise your time spent in this vast and picturesque place, take full advantage of our Scotland guide to organise a truly memorable trip. Whatever the season, whatever the weather, Scotland has a wealth of attractions; from cultural and historical wonders, to awe-inspiring science and nature, it has it all. Our Scotland guide keeps you up to date with the most popular tourist hot spots throughout the country, from the cities to the hills and along the coast, explore everything this magical land has to offer. Visiting the National Museum of Scotland will take you back in time to showcase the proud arts, crafts and history of this powerful nation. We provide all the useful links and information you will need so you can plan a perfect break and not waste a single moment. Scottish Castles include some of the oldest and most well known castles in the World and no matter where you are in Scotland, a castle or abbey is never far. On the castles and Abbeys page are some of the most beautiful castles and abbeys in Scotland. We have chosen some amazing driving tours in Scotland and described them in detail including Bealach na Bah, the entire west coast route, the Road to the Isles, the stunning drive through Glen Shiel and Glen Etive. With these tours you’ll get to see the best Scotland has to offer. With all the nature, mountains and beautiful scenery Scotland is an excellent country to discover on foot, either walking or climbing. Besides the many well and less maintained tracks and walkways, and the joys of walking off the beaten tracks, there are also the more known long distance walks. What’s a visit to Scotland if you haven’t at least visited one of the world famous single malt whisky distilleries and found out how they create your favourite dram. This page has the most popular whisky distilleries listed by region. It’s good to check the opening hours of each individual distillery, they often have silent periods in the summer! Although Scotland has great amount of wildlife to discover all over the country, it is always nice to have a closer view of the inhabitants of this great land. There are many wildlife parks and Zoo’s in Scotland showcasing the many different types of wildlife in Scotland past and present. People seeking an opportunity to hit the slopes need only look to Scotland as the five resorts available offer something for everyone. Here is a guide to the resorts and the best options to save you money so your time on the slopes is enjoyable. Fingers crossed for plenty of snow! The Nevis Range mountain gondola system, the only of its kind in Britain, was originally constructed on the mountain of Aonach Mor as a way to transport skiers to the slopes. The gondola is also widely used as a short cut by climbers to the many challenging winter routes and by paragliders and hangliders on their journey to the clouds. The new National Museum of Scotland is now open! Explore the diversity of the natural world, world cultures, art and design, science and technology and Scottish history, all under one roof. The museum is located in Chambers Street, Edinburgh. The museum is open daily from 10:00-17:00, admission is free. Kelvingrove Art Gallery and Museum is Scotland’s most visited free attraction. Kelvingrove has 22 themed, state-of-the-art galleries displaying an astonishing 8000 objects. The collections are extensive, wide-ranging and internationally-significant. They include natural history, arms and armour, art from many art movements and periods of history, and much more. Kelvingrove is located in Argyle Street, Glasgow. Admission is free. Following the 1746 defeat at Culloden of Bonnie Prince Charlie, George II created the ultimate defence against further Jacobite unrest. The result, Fort George, is the mightiest artillery fortification in Britain, if not Europe. Scotland’s influence on the maritime history of the world from the eighteenth century to the modern day has been enormous and out of all proportion to the size of the country. The two sites operated by the Scottish Maritime Museum contain the exhibitions and collections that tell the story of that great maritime tradition. The Scottish Maritime Museum has two unique sites, one in Dumbarton and one in Irvine. Some say that Scotland is a massive garden all by itself, with stunning lochs and mountains set as a backdrop to beautiful forests and moors. Fact is that Scotland has, despite the somewhat changeable climate, a lot of stunning gardens spread all over the mainland, the cities and islands which are very much worth visiting and are a joy for the garden enthusiast. Situated amongst some of Scotland’s most beautiful scenery in Argyll and Bute, lying deep within Ben Cruachan is one of the country’s most amazing engineering achievements. The world’s first high head reversible pumped storage hydro scheme is housed in a gigantic man-made cavern. The Visitor Centre houses the free exhibition area and is the starting point of the guided tour. The Glasgow Science Centre has three floors packed with hundreds of interactive exhibits that will fascinate you. The Science Mall also plays host to interactive workshops. You can also visit the Science Show Theatre, the lab and Planetarium – one of the finest planetaria in the world. Next door is the large-screen Imax cinema and the 400 feet high Glasgow Tower. The Scottish Seabird Centre is an award-winning five star wildlife attraction with something for everyone, come rain or shine: Discovery Centre, boat trips, gift shop and café. The centre is open every day and can be found in North Berwick on the sea front. This magnificent ship has played host to some of the most famous people in the world. But, above all, she was home to Her Majesty The Queen and the Royal Family. Now in Edinburgh you are welcome on board to discover the heart and soul of this most special of royal residences. The Strathspey Railway takes you on a nostalgic 20 mile round trip along part of the original Highland Railway. The railway is based at Aviemore close to the Cairngorm Mountains. The Museum of Scottish Lighthouses, in Fraserburgh, Aberdeenshire, consists of the first lighthouse built on mainland Scotland and a purpose-built museum. The highlight of a visit is a 45 minute guided tour to Kinnaird Head lighthouse. The museum is open from Easter to October. The remains of the largest cathedral in Scotland, and of the associated domestic ranges of the priory. The precinct walls are particularly well preserved. The Cathedral Museum houses an outstanding collection of early and later medieval sculpture and other relics found on the site, including the magnificent St Andrews Sarcophagus of Pictish date. Admission by joint ticket with St Andrews Castle. Just outside Kinlochewe is the Beinn Eighe mountain reserve. It has a visitor centre and two very well maintained trails. The woodland trail and the mountain trail. Both the walks pass through the remains of the great Caledonian forest. The views from the top of the mountain trail over Loch Maree and Wester Ross are absolutely stunning. At Loch Lomond Seaplanes we offer scenic tour flights from our seaplane terminal in Glasgow’s City Centre and from our seaplane locations on Loch Lomond. From Glasgow experience the excitement of a take off and landing on the River Clyde. The dynamic new Riverside Museum displays Glasgow’s rich industrial heritage, which stems from the River Clyde. The Tall Ship is berthed alongside the Museum, creating a fantastic experience in this stunning setting. Visitors can relax and enjoy the riverside views in the Museum’s cafe, and take home all manner of transport-related gifts from the Museum’s shop. The Perfume Studio in Mellon Charles Wester Ross design and make an original range of perfumes, fragrances, skin creams, toiletries and soaps which are sold in our gift shop. You can also order them here. Our bright and airy Aroma Cafe has spectacular views across the loch towards the Torridon mountains. We serve delicious lunches, home baked cakes and a distinctive range of aromatic coffee and teas. Experience the legend of Loch Ness the best way possible – on the water. A cruise with Loch Ness by Jacobite is a superb way to experience the magnificence of the loch and explore its stunning attractions, such as the ancient ruins of Urquhart Castle. With cruises and tours from one hour to a full day and four departure points, Jacobite offers something for everyone. The far northwest of Scotland is one of the oldest landscapes in Europe. The rocks here tell of ancient oceans, vast deserts and ice sheets. Knockan Crag is renowned internationally as one of the most important sites for understanding how the landscape of Northern Britain was formed. CairnGorm Mountain is home to Scotland’s only mountain railway. It is a unique visitor experience and allows people of all abilities to reach the Ptarmigan Restaurant and weather watching terrace in around 8 minutes from the Base Station. From here you can enjoy stunning views over Strathspey, marvel at the mountain weather on any day.